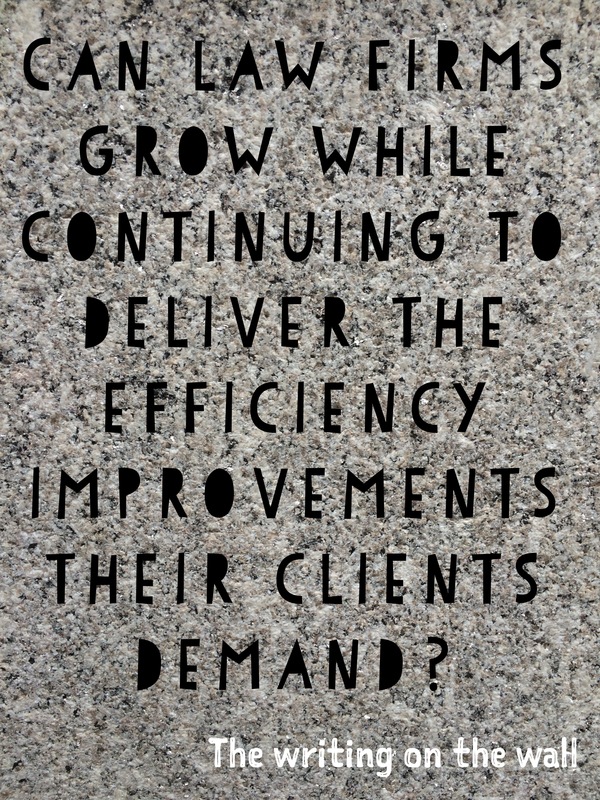 Efficiency + Growth = ? Almost exactly three years since I called time on this blog (see The End of the Beginning) , I now feel called to reignite it but in a way that better fits in with the way social media has evolved. The battle for attention has intensified – lawyers and their business colleagues (whether in law firms or businesses) are more overloaded with information than ever. A partner at a large UK law firm calls it the “fight against digital obesity” while another talks of fee earner productivity in firms dropping, yet the lawyers are working harder than ever. Working in the profession for nearly twenty years, as lawyer, client, consultant and supplier, this is a trend I have seen evolve and intensify. As Davenport highlighted in his book The Attention Economy, attention is an increasingly critical resource. With this in mind, I have over the last ten years refined a set of content sources that consistently cover the most relevant and thought provoking trends in the fast-changing legal market place and the skills and capabilities lawyers and their colleagues need to stay ahead of the game. I curate and share the best of this via twitter and Linkedin, and am conscious that the legal world probably doesn’t need me starting blogging again and adding another item to an overloaded agenda. The other aspect to this is that much of my message in the last ten years has been the need for law firms to embrace efficient working (a challenge which many of the large firms are now genuinely meeting rather than skirting round the edges), and as such I believe it is important for me to operate in a way which makes a thoughtful trade off between the time I invest in the blog and the impact it has for my readers, my company and for me personally (and anyone else with a similar philosophy might like a look at Essentialism, one of the best books I read this year). For my readers, I do believe I can offer a different perspective on the legal market. As well as the roles I mentioned earlier, I have spent the last three years focusing on the world of in-house counsel in the UK, and have interviewed, researched and worked with many different in-house teams. For the last six months I have been in a similar role working with the UK’s largest law firms, which adds another dimension to my thinking. Synthesising this and drawing out key trends prompts a number of questions in my mind about the challenges facing the profession. It is these questions that will form the basis of this blog’s revival – posted as “the writing on the wall”. As ever, I’d love your feedback on both the format and content. I genuinely hope they are useful and get you thinking. This is a post about endings. It has two main parts. Firstly, the legal profession, and my thoughts on where we are in the evolution of the legal services market. Secondly this blog, and where it’s going (if you don’t give two hoots about this, stop after the first section – that’s fine by me). I started writing this post almost exactly two years since I started blogging, and the amount of change in the legal profession in that time has been phenomenal. It’s as though much of the innovation and drive that has been missing from so many parts of the profession for decades has suddenly been discovered and injected into its flabby buttocks. Yet it really only is just beginning. My first couple of posts were about how change was coming and that the increasing pace of the market meant traditional ways of formulating strategy were unlikely to be fast enough for law firms to be successful in the new world. New business models – did you anticipate the Co-op hiring a top-end family law team? The speculation about the possibility of UK law firms attracting external investment and the potential that brought began to become reality with the emergence of new law firm franchise models and the well publicised investment in Quality Solicitors (mentioned above). Much of the focus in this area was on consumer focussed legal services, but in the world of commercial law, pricing models continued to vex the profession, with pressure on profits resulting from a growing rejection of the billable hour model and a re-examination of what value really means in the world of legal services. Irrespective of whether lawyers were working in the world of business or consumer legal services, traditional career paths were breaking down and new options were emerging. This in turn has triggered a debate about how fit for purpose current legal training is – and, in particular, against the current economic backdrop, whether training as a lawyer is a sensible career choice. Massive change, in the space of two years. This change will undoubtedly continue, and in my view will accelerate. For the agile, entrepreneurial firms and lawyers, and those new entrants with the assets and appetite for success, this is a time of great opportunity. For those law firms struggling to change, sitting on the fence, or burying their head, the end may not be as far off as you think. So for those law firms, I do think this is the beginning of the end, but for many more this is the end of the beginning. Let your creativity and courage take centre stage and sieze the opportunities that will emerge. And so to this blog. After two years, around 100 posts and over 35,000 views, it feels like it’s time for a change. Time to sit back and watch the market – watch new business models and legal service providers emerge and challenge old ways of thinking. Time to listen to new voices and examine the new perspectives that will undoubtedly join the more established commentators. Time to reflect on the fantastic comments and feedback on the blog thus far. I feel I have a book brewing, and it maybe that a break from the blog helps me get it written. It may be that some of the developments in the profession get me blogging again sooner than expected. But for now, it’s goodbye and thanks for reading. If you’re a new visitor, take some time to explore the links in this post. If you’re a regular, thanks so much for your support. You are the reason I’ve been writing, and I sincerely hope you’ve found some of my posts helpful. Postscript – how the year turned out. The busiest day of the year was January 18th with 2,870 views. The most popular post that day was You are wrong. I am right..
Top search terms were: intelligent challenge, value disciplines, chargeable hours, and identify the best value discipline. Most visitors came from The United States. The United Kingdom & Netherlands were not far behind. The legal market place – carnage or opportunity? When you look at the legal marketplace, what do you see? With the implementation of the far reaching Legal Services Act finally happening in the UK (albeit with some fairly significant delays in related regulation), it seems the right time to step back and assess the state of the market. Talking to people in the profession about this, from partners to in-house lawyers, business development directors to IT professionals, through to trainees and law students, one thing is clear. There is no single opinion on the state of the market right now. Opinions are strong and polarised. One group see the profession as an industry in decline. Painful struggles with increasing firm overdrafts and personal debt are symptomatic of underlying structural problems with the profession, and the cash flow challenges facing many firms are just another indicator that it’s time to get out before the interest rates rise and bankruptcy looms large. With lawyers at both small and large law firms working harder than ever, increasing competition from overseas firms and LPOs becoming more visible, and constant talk of a new wave of competition, does not fill them with hope that easier times are ahead. Small firms worry about hyper efficient, large scale competitors with a resource base, national reach, consumer brand and technology platform that they simply can’t match. Large firms worry about transactions being disaggregated and large chunks of profitable work being placed with legal service providers with a cheaper cost base. Mid-sized firms talk about being squeezed, with larger firms looking for work in new markets just to keep their associates busy while they weather the current economic storm, and about smaller, more agile firms punching above their weight. These people can often see the need for change, but despair of the pace of change in many law firms, pointing out that the culture and consensual nature of partnership often make decisions glacial when they need to be made at the speed of the digital world we now live in. They look at the management of their firm, and question whether they have the right skills and experience to thrive in such a turbulent environment. Management themselves wonder how they can free themselves from operational fire-fighting to spend time focussing on the strategic questions that will define their firm’s future. The lawyers lower down the pyramid see equity structures remaining in some firms that encourage low performing partners to sit back and coast, while the best talent works their asses off and often still finds it impossible to break into the club. Below them are a generation of students who have made a huge financial and personal commitment to enter the profession, and are finding training contracts like gold dust. Those that are lucky enough to find work may be confronted by suggestions that the legal training system is in need of reform and is not equipping graduates with the skills they need to excel in the profession and exceed client and colleague’s expectation. They may also be confronted with a linear career path, and find that if that’s one they are willing to follow, then the demands made by the firm are at odds with a generation Y philosophy that puts greater emphasis on work/life balance. Those who see the world in these terms often point to clients showing less loyalty and who have ever increasing expectations in terms of service standards, yet in the same breath are looking to pay less for that service. A widespread rejection of the hourly rate billing model leaves many firms struggling to come up with a viable alternative and without the capability to re-engineer their business model to support these new fee structures. The downward fee pressure squeezes profit margins further, and even after several rounds of morale-sapping restructurings and redundancies, with economic growth in the core western markets slow at best, there’s no end in sight. Now those that know me know that I’m on balance, a pretty upbeat person, so let’s try and bring a bit of balance to the picture. First and foremost they see an incredibly profitable sector that has weathered an unprecedented recession and shown real resilience with relatively few high profile casualties. They see businesses with the ability to offer a broad portfolio of services that add real value to clients at critical points in their lives or organisational existence. Many of these services are counter cyclical (helping manage difficult economic conditions) and many of which allow the lawyer to genuinely claim that coveted position of trusted advisor. It’s not hard to point to law firms that have access to senior people at some of the best and biggest companies in the world and advise some of the most influential people who are shaping society. For those in the UK, having a core competency in the English language and the common law system that underpins many other legal markets means firms are well placed to support global businesses and expand intro higher growth international markets (as indeed many UK firms have done very successfully). While there would be an acknowledgement that the bar for client acquisition and retention is being constantly raised (particularly by increasingly sophisticated business development professionals and practices) this is raising standards in the profession and represents progress. There is still a huge opportunity to win by being ahead of this curve and setting the pace. For those with one eye on the future, advocates of the profession will point out that the chance of a career offering not just the potential to earn big bucks, but one that can offer a lifetime of intellectual challenge and stimulation, will always attract its fair share of top talent, and that the training and development opportunities within law firms have improved massively over the last ten years. Those who see opportunity see the ability to innovate as being a genuine source of competitive advantage, and are looking at technology, process and efficiency as ways of maintaining and indeed improving profitability in a fast changing market. The ability to change quickly is a key enabler, and they recruit the people with the ability to adapt and thrive to make this a reality. They also see that market consolidation can offers opportunities. Low price acquisitions, the ability to pick and chose individual teams, to make strategic acquisitions of particular clients or relationships, and the clearing out of some of the noise in the market place. Yes clients are demanding “more for less” but that’s a common refrain across all business these days – the change facing the profession is not unique and in many other industries there are organisations that came out as big winners. A somewhat simplistic categorisation, but I urge you to reflect – which messages resonate most, and critically, what are you going to do about it?